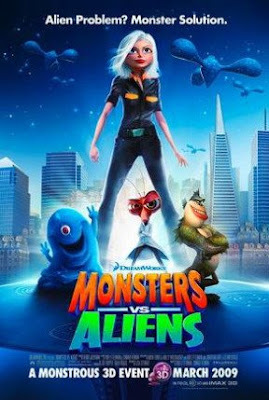 Experiencing Los Angeles: "Susan vs Helen"
My kids (ages 7 & 9) have wanted to see "Monsters vs Aliens" ever since they saw the trailer last December. But they didn't want to see it in 3-D.
OK by me. I actually had to hunt for a theater here on the westside that was showing it in traditional 2-D format. We ended up at the early show at the Fox Village in Westwood Village (see my blog entry above). The film centers around a character named Susan, who after being hit by a meteor is transformed into a 50 foot superhero (or "monster" if you will) who, along with her monster friends, saves the world from a band of aliens. Hence the title. I was curious about a movie that Los Angeles Times film critic Betsy Sharkey called "a story-time version of Feminism 101." Of course, the film (which grossed $58 million it's first weekend) has some great, entertaining scenes. There's enough humor to keep adults engaged ("we need scientific experts," yells the President of the United States, "someone contact India!"). But the film tries too hard to sell the idea of "female empowerment." Derek (Susan's fiancee) is a self-centered, egotistical wimp. (What's never explained is what Susan found attractive about this guy in the first place - but I digress.) When Derek dumps Susan because a 50 foot female might hurt his career, Susan moves on proclaiming "I don't need a man - I can can solve this problem alone." What she - and we - don't need is Derek. In another scene a High School boy and girl are "parking" in an open convertible. The boy is weak and passive -- and he isn't interested in making out (huh?). The girl is confident and aggressive -- and wants to go for it. When they see an alien spaceship, the boy is "scared" - it's the girl goes and investigates. When it get dangerous, it's the girl carrying the "scared" boy in her arms. Perhaps it was suppose to be funny - but no one was laughing. My 9 year old commented later how "dumb" that scene was. Maybe because, the last time I checked, women aren't attracted to weak men. I'm curious what the reaction to the film would be if the women were portrayed as weak, self-centered, or ditsy ("whatever you say, dear"). Just thinking out loud, here. 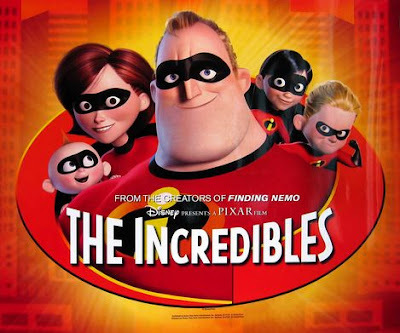 Remember "The Incredibles"? 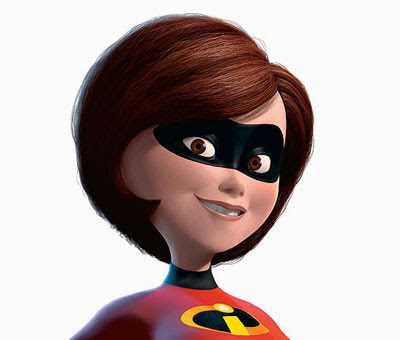 Helen Parr (aka "Mrs. 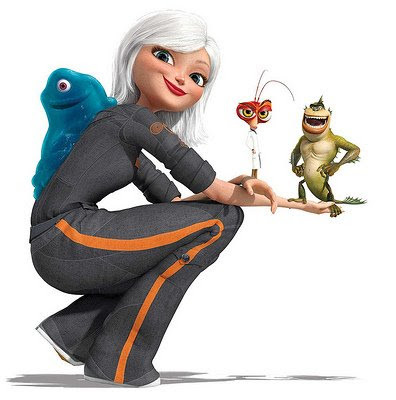 Incredible") was a great example of strong and believable female character. While Susan tells Derek: "I don't need you, I can do it alone," Helen tells her husband Bob "We can accomplish more if we work together." The fact is, we do need each other. I felt like "Monsters vs Aliens" tries too hard too try and prove the worn out expression that "a woman needs a man like a fish needs a bicycle." In the end, even "I don't need a man" Susan needed the help of her monster friends to save the world (ironically, all of which were voiced by male actors). The film provided some interesting conversation with my kids over lunch - at McDonalds in Santa Monica. They ordered the "Happy Meal" which included a promotional toy from, of course, "Monsters vs Aliens." Some things you just can't escape from.